Does anyone know anything about this cars reliability, cost of ownership, etc..? I've decided to move on from the FX and thought that this may be a better choice? What do you think? The M should be reliable. I've looked at three websites and they all rank reliability highly, though there are not many people surveyed in each one. Since you are concerned about reliability you should look at the Lexus GS and ES and the Buick Regal. 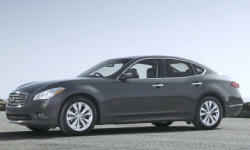 Reliability is generally very good with Infiniti, however performance models aren't quite as good. Still a little better than average. Be advised, the gas mileage is absolutely terrible on the larger Q and M class Infiniti vehicles. Also, if there is a mechanical issue of any kind that requires a dealer to address, you'll pay handsomely to get it fixed.